Contact lenses are available in a variety of colors and powers. 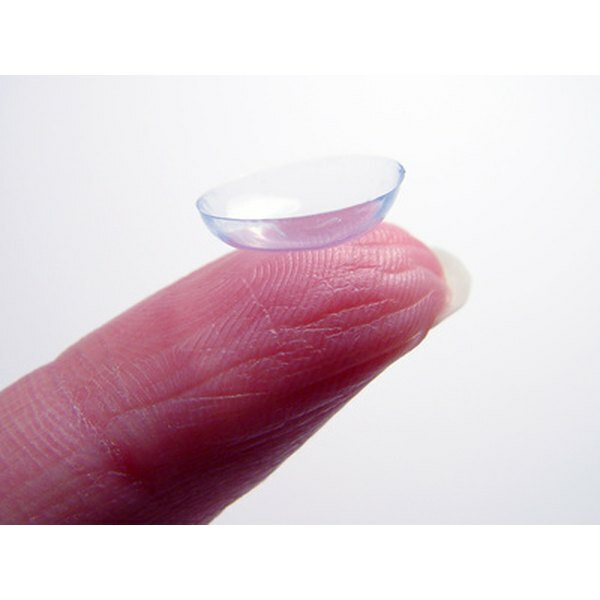 Contact lenses provide a convenient way to improve your vision or enhance your eye color. Because the lenses are placed directly onto your eye, proper cleaning and care is necessary to avoid infection or damage to the eye. Cosmetics, pollution and bacteria can build up on your lenses, causing discomfort and irritation. According to Helene D. Clayton-Jeter, OD, of the U.S. Food and Drug Administration, you should clean your contact lenses daily unless they're disposable. Wash your hands thoroughly with soap and rinse them. Dry them with a towel. Remove the lens carefully, and place it into the palm of your hand. Close the drain if you clean your lenses over the sink. Rinse it with the lens cleaning solution on both sides. Apply 3 or 4 drops of lens cleaning solution to the lens, and rub it with your finger for 20 seconds to remove any residue. Turn it over, and rub the other side. Hold the lens with two fingers, and rinse it with lens cleaning solution. Don't scratch the lenses with your fingernails. Place the lens in the lens case, and fill it with fresh solution. Close the lid tightly.